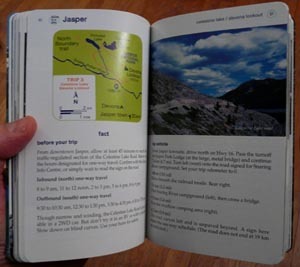 In “Done in a Day Jasper: The 10 Premier Hikes” you’ll find a passionately written, easily portable book containing just the right amount of details to make your Jasper National Park day hiking experience one of a kind. Kathy and Craig Copeland wrote the book in a mindful way, to help you appreciate the experience of day hiking in this corner of the Canadian Rockies. The book starts by introducing you to hiking in Jasper National Park, one of the gems of the Canadian Rockies. You’ll get a quick glimpse of what to do and where to eat in Jasper. You’ll learn what topographic maps are preferred and what weather to expect. The introduction also contains hiking advice. You’ll learn how to avoid bear encounters, why you should carry a compass, and how to prevent hypothermia. Part of this karmic debt load can be reduced, the authors explain, by staying on the trail and respecting follow hikers. I’m 100% behind that! The book then goes on to cover the 10 premiere Jasper National Park day hikes. Giving away the ending to a movie takes the fun out of it for your friends. For the same reason, I’ll avoid listing all of the day hikes here. The mix of top Jasper day hikes includes several easy 2 to 4 hour hikes, several moderate and challenging hikes, and an epic 10 to 12 hour day hike. I will provide a teaser and say that the Cavell Meadows hike to Angel Glacier is on the list. This is a popular hike (see why). So let’s look at what Kathy and Craig write about the hike for a sense of the book. Next, the authors discuss facts about the Cavell Meadows and how you should check at the Jasper Information Centre to make sure the trail is open. The book provides driving directions and then a detailed guide to the trail (distances, junctions, and key sites). So that’s what the day hiking chapters are all about. Several of the day hike chapters give short and long day hike options – it’s like 15 hiking options for the price of 10. You’ll learn how to get the most out of a 3 hour Jasper National Park day hike, but if you’re up for extending it to a 6 or 7 hour hike, the authors provide details. That will make me look at fellow stick toting hikers in a different light from now on. Kathy and Craig are incredibly dedicated hikers and have authored much on the topic (they have a few other books on Canadian Rockies hiking too). Portable size – Packs detailed and accurate guidance in a small size. Passionate – Kathy and Craig Copeland’s passion about hiking and the environment shows through in this book. I can only hope the passion rubs off onto others. Humorous – Witty and humorous tidbits scattered throughout the book. 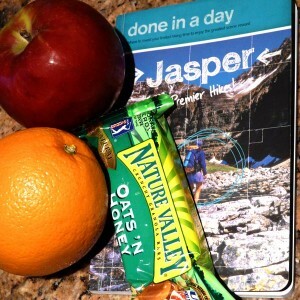 Pictures – Contains pictures of inspirational scenes from actual Jasper day hikes. Worth the price – For not much more than the price of a good meal, you can have a guide to the views of a lifetime. A portion of proceeds goes to charity – The publishing company, run by the authors, is a member of “1% for the Planet“, a business that donates 1% of their sales to the natural environment. None, though some might say more detailed maps would be beneficial. Even though the book’s detailed descriptions provide all that’s really needed to navigate, I’d personally just bring my hand-held GPS (with compass) to see my current elevation, distance traveled and other measurements. I’m glad I bought the book and expect it to help me to make the most of my next trip to Jasper National Park this summer. The book will be in my hands while day hiking. I wish I had it last time.
. Going to Banff too? 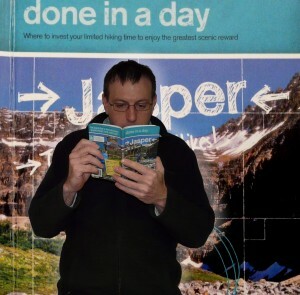 Check out “Done in a Day: Banff” by the same authors. Thanks for the book heads up. I’ve wanted to hike Jasper and now I can plan my attack. Do you have a preview of the full day hike. I’m always looking for challenging routes.